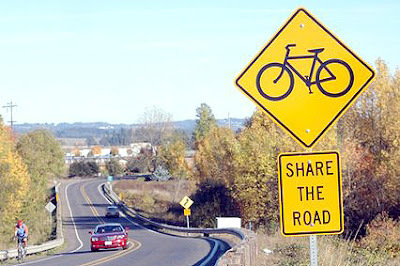 Bike Commute Tips Blog: "Share the road" means what, exactly? There is an effort to create a "Share the Road" specialty license plate in California, similar to those in other states, such as Florida, Colorado, or, my favorite, Texas ("Share the Road, Y'all"). 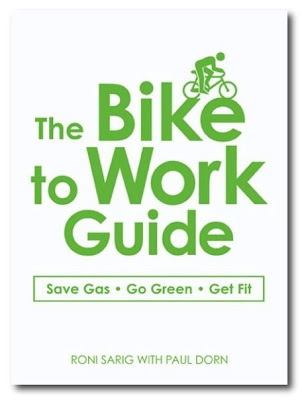 This petition effort has inspired some discussion on a few of California's bicycling listserves and blogs. In San Francisco, the mood is rather tepid: "We're beyond that." I've signed the petition though I think the wording is obtuse for those obtuse drivers we're trying to send a message to. Something more blatant like "Watch for Bicycles" would be better. In communities where similar programs were pursued, drivers immediately misinterpreted the [Share The Road] slogan to be aimed at cyclists they perceived as hogging the road and getting in their way. It's a terrible slogan. =v= Seriously, though, San Francisco trumped "Share The Road" with the far, far, superior "Allowed Use of Full Lane" signage. I see no point in investing State resources into the far, far, inferior slogan when we've got this great precedent already. During my brief tenure as executive director of the California Bicycle Coalition, we heard a few inquiries about a "Share the Road" specialty plate. 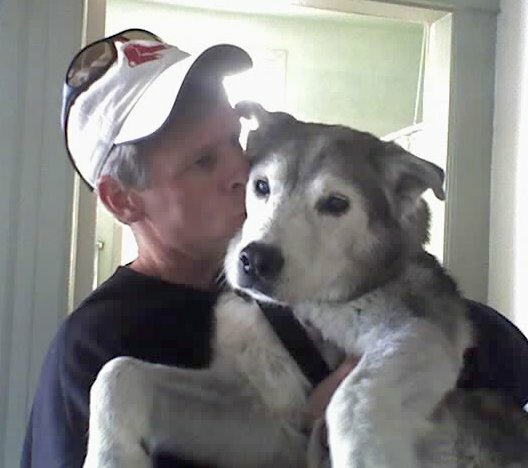 It wasn't a priority then, and I don't think it should be a priority now. The benefits for bicyclists would be negligible. Such a plate would, at best, have symbolic significance, rather than practical benefit. At worst, a specialty plate campaign is a distraction from more pressing needs. Symbolic victories are important to any movement in the early stages of organizing, helping to build momentum and credibility and to attract new members. In California, we should be far beyond settling for "symbolic" gains. We need political organizing that leads to substantive improvement for California bicyclists. Paul, you rock. I'm glad there are people like you encouraging strategic planning over bandaid solutions. =v= Someone told me that the "Full Lane" signage should be white, not yellow, since it's regulatory, not a warning. I've seen a white "Full Lane" sign in San Francisco. 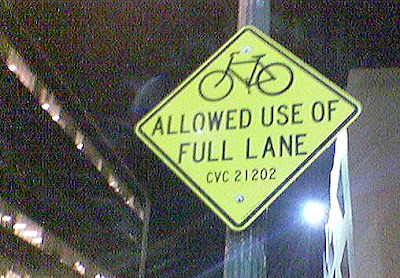 An even terser "[Bicycles] MAY USE FULL LANE" has been proposed.